After much consideration we feel the only practical place to store the rod/reels is in the Salon. We debated and given a great deal of thought about rod storage. The "Water Dog", a 44' Scarbourough, had what I felt was ideal storage done in the overhead of the Engine Room. Unfortunately we do not have the space in our Engine Room. 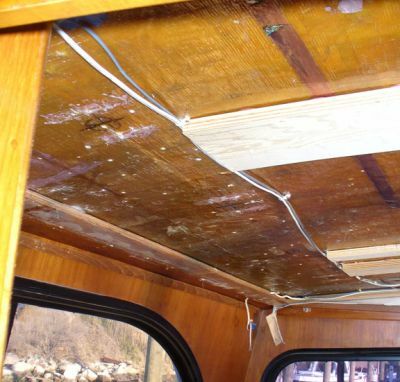 I considered making storage under the VIP bed, in the Guest Room, under the Master Stateroom bed, on the Bridge, etc. But getting the rod and reels from any of these places to the cockpit would be certain to scratch or break something. 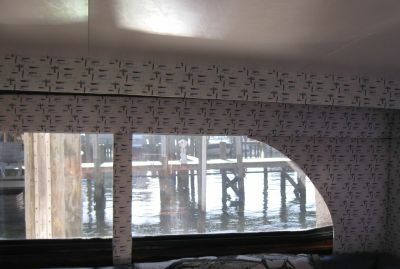 The salon is closest to the cockpit and has enough room to swing a rod and reel around and out. We are still working on the solution but this is our start. 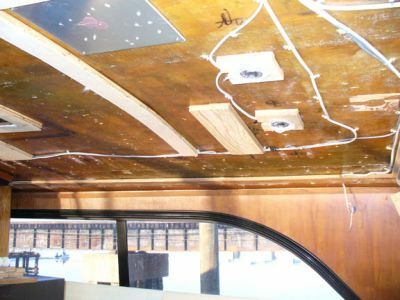 Note that all lights and framing, over the couch, have been removed from the headliner area on the starboard side of the boat. The cleared area amounts to about 22" wide by almost 9' long. The plan is to make a shadow box that will soften the look of the rods being stored there. We are not sure how many we'll be able to arrange but are thinking about different ways to stack them. 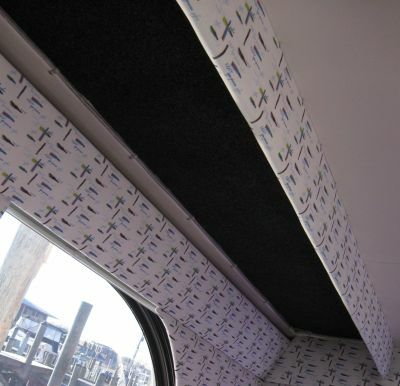 We had considered a mirror for the base but are also considering the same white vinyl used for the headliner or perhaps even a dark material.